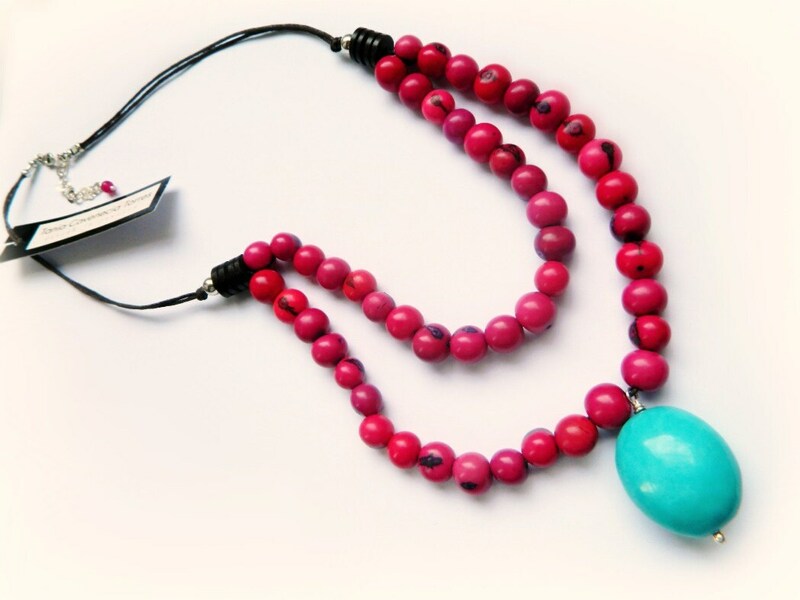 Elegant and colorful eco-friendly Acai necklace in beautiful berry colors and turquoise. 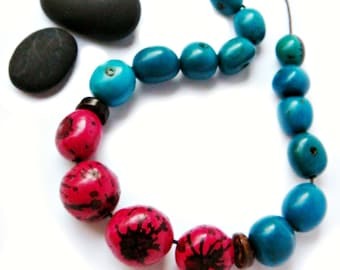 The round plump pendant is Chalk Turquoise which contrasts beautifully against the vivid colors of the Acai seeds. The seeds are strung on a waxed cotton cord, held in place with wooden cylinders and large sterling silver round beads crowned with a secure knot. Giving the necklace a bit more elegance are sterling silver ends and a small sterling silver lobster claw clasp. 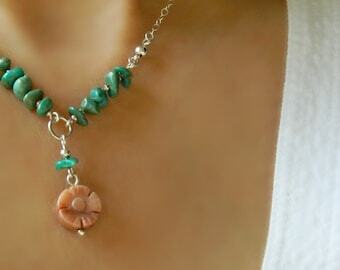 A petite semi-precious bead in a deep pink is attached to the end of the sterling silver chain for a finishing touch. The chain also gives the necklace an adjustable length. Acai seeds are from South America and are natural materials, no two are a like. The seeds are dyed what I call mixed berry. It was very difficult to capture the vibrant colors accurately. The color of the seeds range from a mauve pink to vivid fuchsia to a bright apple red. Depending on your monitor they may appear more red but are truly wonderful eye catching colors. ★ Acai seeds are not only beautiful natural materials but are also eco-friendly. The seeds are the byproduct of harvesting the Acai fruit, instead of simply discarding the seed it is repurposed into beautiful jewelry. The Acai seed is a sustainable and renewable resource that provides an alternative to rain forest destruction and gives additional economic resources to the native people of the rain forests of South America. 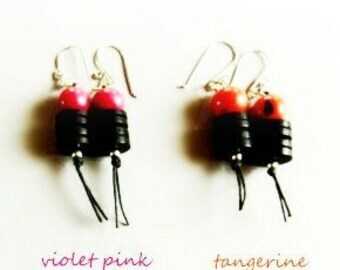 ♥ Your Eco Acai necklace will arrive beautifully wrapped. If you would prefer the faster Priority shipping please contact me before making your purchase so I adjust the shipping rate for your item before going through check out.